Show your guests a little leg. 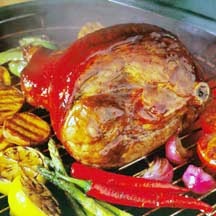 This fresh leg of pork roast is a great way to welcome the summer grilling season. Serve with grilled vegetables and fresh seasonal fruit. Prepare medium-hot banked fire in kettle-style grill. Season pork roast with salt and pepper. Grill over indirect heat, not directly over fire, in covered grill for 1 1/2 to 2 hours (about 18 to 20 minutes per pound). Meanwhile, stir together barbecue sauce, jelly and chili powder. The last 30 minutes, start basting with sauce mixture every 5 to 10 minutes until internal temperature of roast, measured with a meat thermometer, reads 150°F to 155°F (approximately 65°C). Remove roast from grill and let rest 5 to 10 minutes before slicing to serve. Makes 8 to 12 servings. Recipe and photograph provided courtesy of National Pork Board.